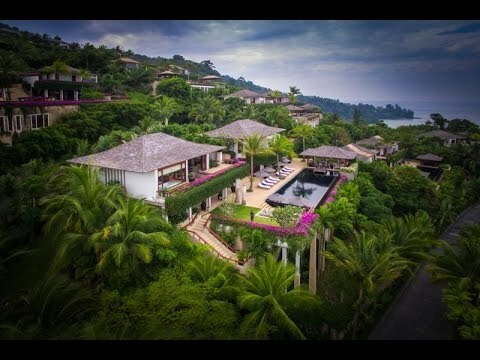 Andara is charmingly set on a hill which rises from the shimmering Andaman Sea on the upscale west coast of Phuket Island which boasts of stunning sea and beach views. It is conveniently situated within minutes to many of the island’s best restaurants, boutiques, resorts, world-class golf courses, and many other attractions and services. Spacious, elegant, comfortable, and luxurious are only 4 of the most prominent words used to describe this villa, and rightfully so as these descriptions are very apt. The villa has one master’s bedroom and five guest bedrooms, all rooms come with en-suite luxurious bathrooms and breathtaking sea views. The villa is spread over three floors and its entrances to the residence is through a private garage and through a main entrance which is close by. The top floor is home to the master’s bedroom with an en-suite bathroom, as well as two other guestrooms with en-suite bathrooms. The middle floor is home to the main living area, which is composed of an enlarged pool, terrace area, living/dining room, large European-style kitchen, family/entertainment room and one guest room with an en-suite bathroom. To add to that, the middle floor also features a large dining sala with comfortable seating that faces spectacular sea and mountain views, which are the main focal point of both the top and middle floors. This description would not do justice without mentioning other comfortable facilities set inside the villa, such as a fully-equipped gym and spa on the lower floor. A powder room completes this area which is accessible only by a couple of steps. The internal areas, such as all bedrooms, were constructed using only the finest materials; residents will undoubtedly enjoy the natural feel of rich hardwood flooring, architraves with matching doors, silk-lined wall inserts, and high-arched ceilings. All en-suite bathrooms are large, luxurious, and have soft-lighting, as well as a superb use of mirrors to enhance the exquisite ocean views. The large European-style kitchen is fully-equipped and a delight to use, a nearby maid’s quarters is efficiently next to this area. The “Instagram-ready” property comes fully-furnished with superior quality heavy furniture thoughtfully combined with local artifacts and antiques; all tastefully positioned and presented.